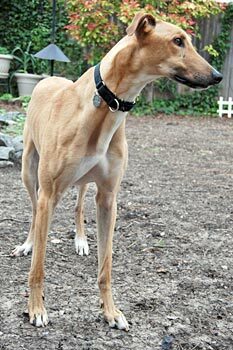 Joe, aka Joe's Whatfor, is a handsome, 2-year-old, red fawn male, born March 24, 2006. His sire is the Irish bred Larking About and his dam is Copperkettlekate, making his grand sire the late Gable Dodge. Joe's career of 11 races ended on December 19, 2007, when he broke his right hock in the back stretch of the track at Valley Race Park. 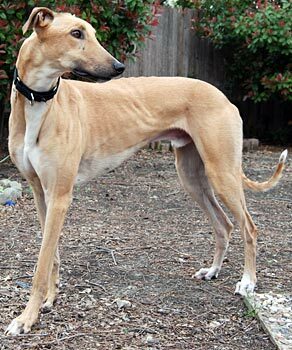 Joe, along with Tami and Skycam, were flown from Harlingen in route to Addison airport on December 22 by GALT adopters and members, Dennis and Didi, but bad weather forced their landing at Georgetown. They were driven to Dallas the next day, where Joe was admitted to the Dallas Veterinary Surgery Center under the care of Dr. Bob Radash. Joe's surgery for a grade IV central tarsal bone fracture of his right hock was performed on December 26, placing two 2.7 mm screws to stabilize the fracture. Joe was in a cast for 6 weeks, and is now released with leash walking only until March 30. Joe's leg is healed and his life as a companion pet will not be affected by this injury. 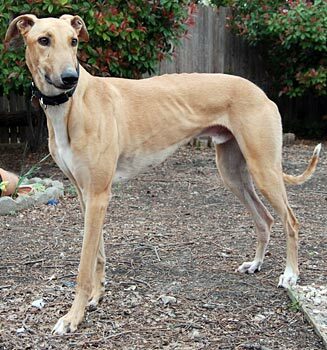 Joe has been living in a foster home with other Greyhounds, a terrier mix, and a cat. He can be considered cat tolerant (with supervision, of course) and may be all right with smaller dogs.